3.�Highlight those features and bring them into view wherever possible to enhance the golf experience. With those goals defined, the course features five sets of tees from professional at over 6900 yards to recreational at just under 4900 yards. The 18 undulating greens will vary from just under 5000 square feet to well over 8000. The course winds uncrowded through the 330+ acre estate, crossing the streams at strategic locations and bringing the streams, creeks, many wetlands, other preserved areas and distant colorful hillsides into view. Numerous natural hazards, including extensive natural water hazards, and breathtaking changes in elevation have all been incorporated into the design. A large 5+ acre lake on the eastern plateau provides an aesthetically pleasing lateral water hazard for several back nine holes. The other large 5+ acre lake adjacent the�Lodge and Conference Center�greets golfers upon arrival and provides a soothing backdrop to the practice greens, greenside and fairway practice bunkers, driving area, and teaching complex. 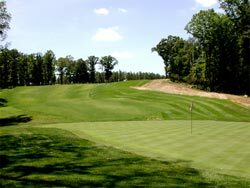 The course meanders over gently rolling hillsides through forests of mature beech, oak, holly and pine trees. Expansive beautifully naturally shaped beech trees define welcoming, warm and soothing edges to several greens, and particularly the 18th. Those beeches and large oaks also line the perimeter of many fairways. In spring, flowers on the numerous wild azaleas and native dogwoods provide a colorful border for the zoysia fairways, wispy fescue maintained rough, Scottish Links style unmaintained rough and bentgrass greens. Other holes cross the streams and protected wetlands with both hand-crafted boardwalks and natural earthen bridges. The 9th and 18th par 4 front and back finishing holes have right and left doglegs which cross the stream onto hillside-backed and rock-wall fronted greens situated directly below the clubhouse. The clubhouse sits prominently on a ridge overlooking both the 9th and 18th greens.